All of the waste produced at a recent fellowship meal at First Presbyterian Church in Asheville, North Carolina, fits on a single plate. One of the original 15 pilot churches certified as a PC(USA) Earth Care Congregation (ECC), First Presbyterian Church (FPC) in Asheville, North Carolina, is a congregation that seeks to put their faith into action not only with deeds of compassion but also through acts of social witness. Finding ways to advocate for justice for all of God’s children, including God’s creation, is essential to being faithful disciples of Christ. All certified ECCs commit themselves to a four-part pledge that affirms that the earth and all creation are God’s. The pledge acknowledges that God calls us to be careful, humble stewards of this earth, and to protect and restore it for its own sake and for the future use and enjoyment of the human family. In committing to this pledge, the congregation agrees to take specific steps in four areas: worship, outreach, education and facilities. FPC takes this pledge seriously. In 2018, FPC communicated their values around caring for creation by emphasizing the importance of decreasing consumption and waste in a variety of ways. 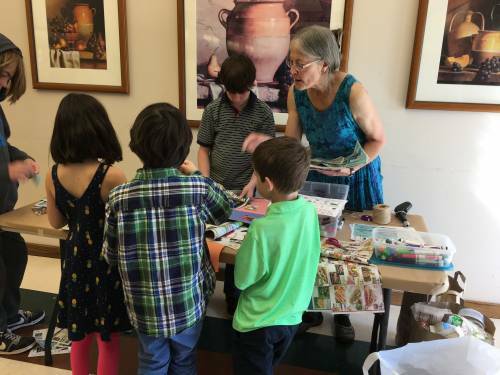 Just after Earth Day Sunday, they hosted a Creation Care Fair, an event designed to educate and entertain people of all ages about reducing waste and moving toward zero waste. The children of First Presbyterian Church in Asheville, North Carolina, work on recycling and composting instructions at their Creation Care Fair. FPC recently hosted a meal for 50 people. 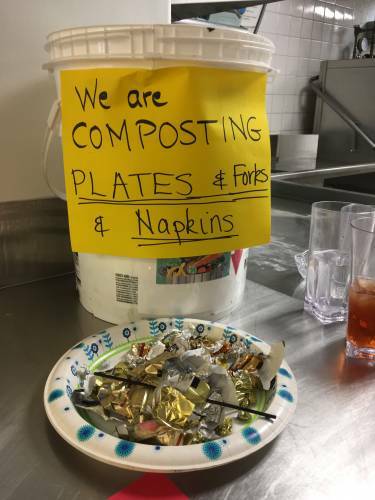 After composting plates, cups, napkins and flatware and collecting the table scraps, the waste for the meal was contained on a single paper plate. As Christians, we have a responsibility to take care of the earth that God has entrusted to us. Too often, that charge isn’t reflected in the ways we gather around the table at church events. Imagine how much waste could be prevented if every fellowship meal only produced a single plate’s worth of waste. Compassionate Creator God, we stand in awe of the heavens and the earth that you have made. We repent for the ways in which we have treated your good gift as disposable. May you continue to make us consistent in our desire to live lighter upon your earth and actively create solutions for improving the world around us. Amen.